With Reinforced Corners and Two Internal Pouches. Adjustable Dividers and a Shoulder Carrying Strap. This case is durable and stylish! This stylish tool case is ideal for computer and copier repair technicians, electricians, photographers and all professionals who depend on their tools for a living. 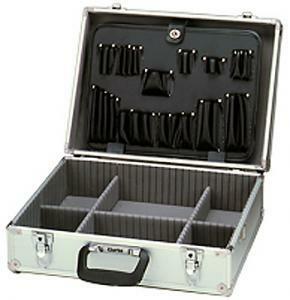 This Clarke tool box is constructed from silver anodized aluminum. The outside dimensions are 18.75" x 14.25" x 6.5" and weighs 8.5 lbs. The inside dimensions are 17" x 12". It has reinforced corners, key lock latches, 2 internal tool pouches, adjustable dividers and a shoulder carry strap. Outside Dimensions: 18.75” x 14.25" x 6.5"
Inside Dimensions: 17" x 12"